The King Maha Vajiralongkorn Bodindradebayavarangkun (Thai: มหาวชิราลงกรณ บดินทรเทพยวรางกูร) His full name is Somdej Prachao Lukya Ter Chaofaa Wachiralongkorn Borommajakrayadisornsantiwong Tewetratamrong Suboriban Apikunuprakarnmahitaladulayadej Phumiponnaretwarangkun Kittisirisomboonsawangkawat Borommakatiya Ratchakumarn (Thai: สมเด็จ พระเจ้าลูกยาเธอ เจ้าฟ้าวชิราลงกรณ บรมจักรยาดิศรสันตติวงศ เทเวศรธำรง สุบริบาล อภิคุณูประการมหิตลาดุลเดช ภูมิพลนเรศวรางกูร กิตติสิริสมบูรณ์สวางควัฒน์ บรมขัตติยราชกุมาร). 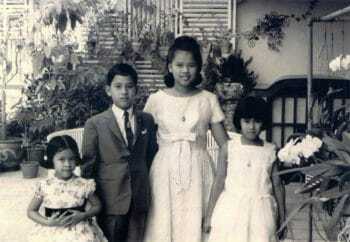 The King is the only son of King Bhumibol Adulyadej and Queen Sirikit. He was born on the 28th July 1952 at 17:45 o’clock; which fell on Monday the 6th day of the 9th waxing moon; at the Amphorn Sathan Residential Hall of the Dusit Palace in Bangkok. It was the 7th years of King Rama IX’s reign. He has one older sister, her full name is Ubolratana Rajakanya Sirivadhana Barnavadi (Thai: อุบลรัตนราชกัญญา สิริวัฒนาพรรณวดี) and he has 2 younger sisters; the first one her full ceremonial title is Somdech Phra Debaratanarajasuda Chao Fa Maha Chakri Sirindhorn Rathasimagunakornpiyajat Sayamboromrajakumari(Thai: สมเด็จพระเทพรัตนราชสุดา เจ้าฟ้ามหาจักรีสิรินธร รัฐสีมาคุณากรปิยชาติ สยามบรมราชกุมารี) and another one her full name is Somdet Phrachao Luk Thoe Chaofa Chulabhorn Valayalaksana Agrarajakumari (Thai: สมเด็จพระเจ้าลูกเธอ เจ้าฟ้าจุฬาภรณวลัยลักษณ์ อัครราชกุมารี). When he was about 1 year old, his full name was set according to his horoscope plus the name of Rama IV and Rama V.
When he was 4 years old, he went to Chitralada kindergarten school on the 1st of September 1956. After he finished kindergarten school he continued his higher education level in England. In 1966, he attended his primary education level at Kingsmead school in Sussex, England. After that, he continued his secondary education level at Millfield school in Somerset, England and finished in July 1970. From August 1970 until May 1971, he went to Armed Forces Academies Preparatory School called King’s school, Sydney, Australia. In 1972, when he was 20 years old and reached his legal age according to Thai law. King Rama 9 then inaugurated His Royal Highness Crown Prince of Thailand according to Thai ancient tradition. In the same year, he went to a military high school named Royal Military College, Duntroon in Australia. He graduated in 1976, and at the same time, he also got his Bachelor Degree in Arts. In 1976 he had additional military field training in Australia. Since childhood, he had a habit of discipline. And was always interested in the army. He visited the headquarters of the Thai army units. He cared much for the well-being of soldiers and police. For this reason, King Rama IX allowed him to have a military education in Australia. Later in 1977 to 1978, he studied in the Command And General Staff College, Thailand. From 1984 to 1987 studied law and obtained a Bachelor of Law degree from Sukhothai Thammathirat University, Thailand. In 1990 he studied in Thailand National Defense College. 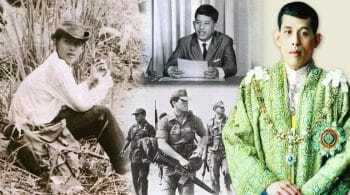 He adhered to the reign of King Rama IX to take care of and help the country with various soil and water problems by developing agencies involved in water resources development in many areas; such as Agricultural Learning Center Kaset Withaya Koh Hae village, Mae Rim district, Chiang Mai and Development Project of the Gubae Srira area , Yarang District, Pattani Province, and also the construction of a reservoir with a water distribution system to alleviate the water shortage problem for many villagers in Dong Mon subdistrict, Dong Luang district, Mukdahan province. Since 2010, the prince has been flying a flight of charity in the 1st pilot position of some special flights of Thai Airways International Company Limited (he donates his pilot fees to charity). And he led many Buddhist communities to pay homage to important sanctuaries. He also donated money for religious purposes; seeing this many other people and organizations donate more money also to contribute the capital for other charitable donations. In 2015, there were some activities held for King Rama IX and the Queen. On the 16th of August, there was an activity Bike for Mon (Thai:ปั่นเพื่อแม่). This was a cycling event commemorating for the Queen on the occasion of the 83rd Birthday Anniversary. The purpose of organizing the event was for all people to express their loyalty to the monarchy and to express their love to their mothers and the Queen. It also gave all people the opportunity to participate in the cycling activity to celebrate and strengthen the harmony of people in the nation. And to promote the good health of people in doing exercise. This was a cult for people to love doing exercise and to create a kind of athletic spirit. He also continues these athletic activities. Further, the King has partaken in many good activities for Thailand and Thai people by helping in education, medical and public health, religion, agriculture, military, and foreign affair.